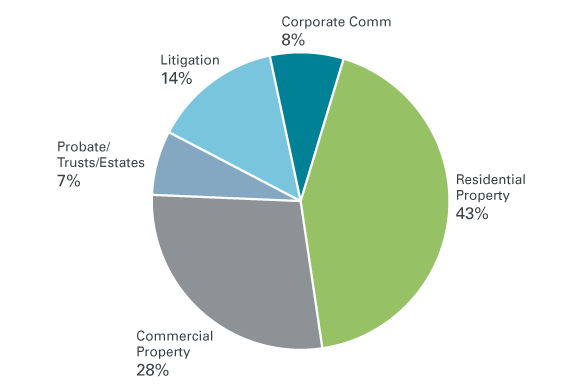 This has been reflected in the recent renewals, as rated insurers increasingly impose significant rate increases for conveyancing work, and restrict/remove their exposure to firms undertaking a significant percentage of residential conveyancing. Small firms have been hardest hit – as insurers, such as XL, exit from the small firm market completely. The economic crisis in 2007 onwards produced a substantial crop of claims, though the seeds were sown in the boom years, where a toxic mix of rising property prices, lax lending practices, and competitive pressure on fees led many practices to be taking on significantly increased levels of risk without adequate controls on process. The residential property market has seen a particularly aggressive spike in claims, just at the time when the conveyancing market was hardest hit. Pressure on residential conveyancing fees has seen a tendency for much conveyancing work to be commoditised, and process-driven. High volume conveyancing, if not implemented with due consideration of risk controls, increases the danger that complex transactions are mishandled and key issues missed. Smaller firms have not always been sufficiently resourced to provide adequate supervision and controls. The complexities of the CML handbook led to its being honoured more in the breach than in the observance in some quarters. The profession has, at the same time, been targeted, to a greater extent than ever before, by both petty fraudsters and organised criminal gangs, who have spotted the opportunity for rich pickings in property transactions. Claims by Lenders have accounted for around a quarter of all claims against the profession in the last four years – the majority of these emanating from residential conveyancing. While claims arising from transactions completed prior to the 2007 economic crisis have, by and large, already been made and notified, insurers have real fears that conveyancing claims are not set to fall away, and moreover, that the root problems have not necessarily been addressed. The individual lender requirements, as set out in Part II of the CML Handbook, also account for a number of high value claims, and it is therefore important to be aware of any particularly onerous terms that an individual lender may impose. Your secretary receives a ‘phone call from a Miss X. She is not an existing client, but your firm was recommended to her by easimortgage, a mortgage broker in the area that has put a fair bit of business your way. When you get back into the office you phone Miss X back. She is looking to buy a flat in a fairly new dockside development in a nearby town. Although she works for a company that has an office nearby, she lives a good 50 miles away and works from home a fair bit. She offers to get a local solicitor firm to certify her documents and get them sent over to you, but you ask her to drop by the office when she is next in town, with her passport and a recent utility bill. About a week later she does just that, and your receptionist duly copies the documents – which seem to be all in order. Having completed your AML checks, you open a file. It transpires that Miss X is buying the flat from her uncle – and so it’s a fairly straightforward transaction. It transpires that the original developer of ‘Merchants Quay’ had gone bust, mid development – and Miss X’s uncle had purchased the flat at a bargain price a year or so earlier as an investment opportunity. As you would expect with a new build, the survey comes back clear regarding the integrity of the structure, and, with the additional benefit of solar PV panels installed by the electricity company, the energy rating of the property is good. There are some white goods being included in the sale. You send your report into the lender, Capital Home Loans, and when they release the funds, the transaction completes as planned. How likely is this transaction to lead to a lender claim? The answer to that depends on the effectiveness of your systems and procedures. How effective is your client and transaction vetting?Beware of introductions from third parties, regardless of how trusted they are. These often may cause you to reduce your guard, particularly if that third party has undertaken AML checks on the client. Do not rely on another party’s due diligence. Do you question why a client is instructing you? Is it because your website advertises that you can complete transactions by phone/email – and therefore may be seen as an easy target? Does your firm seem like a logical choice in the circumstances? What nexus does Miss X really have with the town you work from? If the connection seems remote, consider undertaking additional identity checks. Have you met the client? It may not always be possible – but if not, what additional safeguards do you put in place? How do you conduct your AML checks? Do your fee earners undertake the checks themselves? What do those checks comprise? If your reception staff simply copy the documentation provided, what training have they been given on AML, and identifying fraudulent documents? Do you ever undertake additional checks (using online AML checks from any of the credit check agencies, for example)? Which of the following issues should you have reported to the lender? a. the fact that the transaction is between related parties? d. the potential lack of NBC warranty on the building? e. the white goods (a material impact on the purchase price, or de minimis)? f. the solar PV panels? Solar PV panels installed by a utility company are likely to have been installed free of charge in exchange for a (normally 25 year) lease of the roof. Part 2 of the CML Handbook for Capital Home Loans (CHL)requires all solar panel leases to be reported to them. The CML Handbook contains minimum requirements for solar panel roof-space leases, and, in a recent change to the Part 2 requirements, solicitors are required to report to CHL where a lease does not meet these requirements. The address for notification of issues to report has also recently been updated. While a lender claim for a failure to report is unlikely to be successful if that failure had no impact on the loss, or it can be shown that the lender would have lent the funds in any case, this is not an argument that any solicitor wishes to have. Even unsuccessful claims cost – in terms of time and money. Nor does a solicitor need to have been negligent for a successful claim to be brought: the CML handbook is a matter of contract. The message is clear. Do not forget that the lender is your client just as much as the purchaser is your client. It is essential that you are alert to the requirements of the CML handbook – particularly those issues which have a go to the value/risk profile of the transaction. If in doubt, REPORT. And where you have reported an issue, remember that the lender releasing funds does not in itself constitute an instruction to you to complete. You must receive written confirmation from the lender before proceeding further. Insurers have paid out hundreds of millions in recent years from Property claims in general, and lender claims in particular. Smaller, unrated insurers have gone into administration as a result of the volume and cost of such claims. The remaining market is wary of the ongoing risk. Insurers want to see evidence of a culture of effective risk management, backed up by rigorous systems and procedures. Lockton can provide clients that are concerned about their exposure to conveyancing work with more detailed advice on how best to mitigate the risk, with a view to securing competitive insurance terms.